Our club has some of the best yacht club facilities around including approximately 2 acres of land behind the club house which allows approximately 165 members boats to be stored ashore. The Boat Park Chairman and his team of volunteers manage the Boat Park to maximise its use of space, ensure its safe operation and maintain the clubs plant equipment. 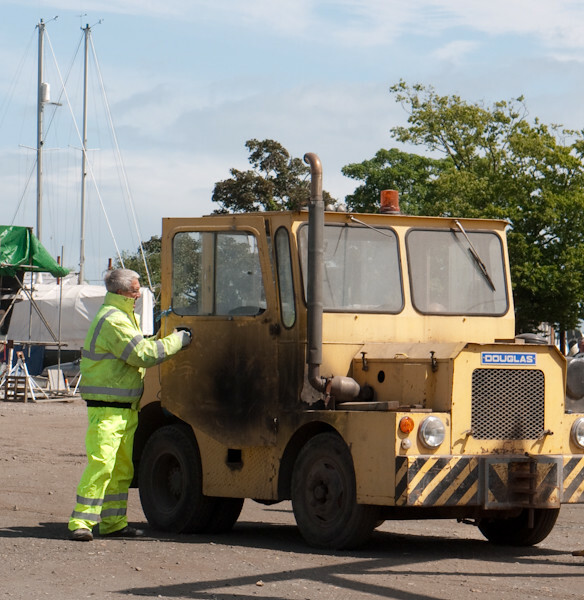 We currently operate a WISE hydraulic boat-lift, 2 tractors, a forklift, a JCB and a road roller. We also maintain the mast hoist above the slip way / scrubbing berth and oversee the storage of tenders and sailing dinghies. The Boat Park team try to provide members with an efficient and friendly service to enable boats to be lifted in and out of the water, however we are a team of volunteers not marina staff. Marchwood is a "self-help club" so members must actively assist with both their own, and all other boats, on the day of their launch, or lift out. We are always looking to welcome new and existing members who would like to join our Boat Park team as trainee drivers/assistants or to assist with Boat Park machinery maintenance, or on the administration side. There is always a lot going on to get involved with, so click here contact the Boat Park Chairman for more details. In order to plan the most efficient use of space in the yard and time spent shunting cradles and trailers, we now use this website for all boat movement bookings. To book a lift out or lift in, simply login to MYC Xtra and select the boat movement you require from your My Account page. You also book the use of the slipway (for drying out) and mast crane in this way. Applications for winter lay-up are also made on your My Account page of the MYC Xtra website. You can apply from 1st May. Available spaces are allocated, and invoices issued, at the start of August to those who have applied before midnight on 31st July. Applications made from the 1st August onwards join the waiting list. See the Boat Park-Information-Documents page for full details of the layup process. Those without access to a computer can book using the club computer in the caravan, or by contacting the Boat Park Administrator. No boats will be moved unless their insurance is up to date on the club database. We can launch, lift out or hold your boat in the rig for a quick scrub etc (with use of the club jet wash if required for a small fee). In addition to winter and summer lay-up we can offer a short stay period in the yard (subject to space being available). See Boat Park-Information-Charges page for the list of current rates. Of course if any member has an emergency we will do everything we can to get their boat out of the water as soon as possible. The Winter Lay-up period commences 1st October and continues until the end of November. Any boats that require lay-up after that date will have to arrange their own drivers from a list of approved drivers. A strict booking and payment procedure exists (see the Boat Park-Information-Documents page) which gives priority based on the club rules. No boat is brought ashore unless prepaid. 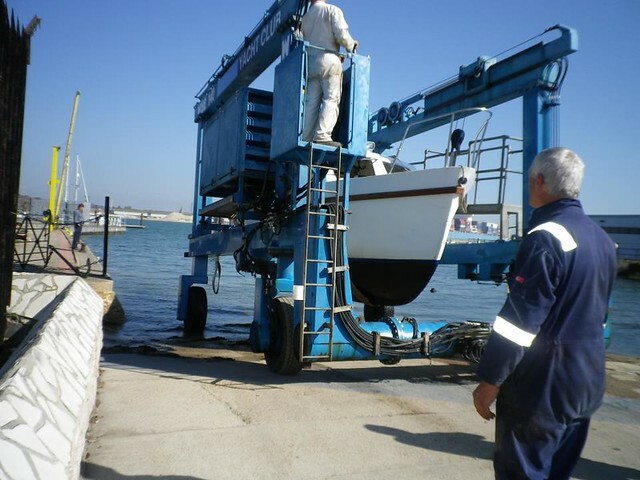 Although we are happy to offer advice on the supporting of vessels in the yard, it is entirely the boat owner's responsibility to ensure their vessel is adequately supported whilst out of the water. Boats using only props must remove their mast before being lifted in to the yard. Application for lay-up starts on 1st May. Launching starts on 1st March. The Boat Park tries to provide drivers on all weekend days until 31th May. Any boats that requires launching after this date, or on week days, will have to arrange their own drivers from a list of approved drivers (listed on the Boat Park-Drivers-Wise Rig page), as most club members including volunteer drivers want to be on the water. From 1st July a summer storage fee applies for the next three months after which, the winter lay-up season begins all over again. If you are blocked in by other boats you need to contact these owners so they are can be there when their boat is moved if they want to. You can find boat owners contact details on the Boat Park-Information-Boat Owners page. As most boats undergo work during the Lay-up season, this inevitably leads to a build-up of waste. Most considerate members dispose of their rubbish either at home or at the recycling centre 5 minutes up the road but we still end up with enough rubbish in the yard each year to require an annual clean up generally requiring a skip. Two days are set aside for this in August / September and we rely on volunteers to help us keep our club in a safe and tidy state. Please note that hazardous waste such as old batteries and paint tins cannot be disposed of or stored at the club and should be taken to the recycling centre once removed from your vessel. There is a tank for the disposal of used engine oil in the welding bay. Please ensure you take your empty oil containers, filters etc to the recycling centre. If you have any questions or difficulties you will, some of the time find one of the team in or around the welding bay, or click here to contact the Boat Park Chairman, or click here to contact the Boat Park Administrator.